Ammonium sulfate is used almost exclusively as a fertilizer material; minor amounts are used in nonfertilizer applications, including use as a cattle feed supplement, for several pharmaceutical applications, and for flameproofing, tanning, mining rare earth metals, food processing, fermentation, textile dyeing, and water treatment. In 2015, it was used mainly (95% of world consumption) as a nitrogen fertilizer material and accounted for about 4.7% of the world nitrogen fertilizer market. Industrial use of ammonium sulfate accounts for only about 5% of world consumption. 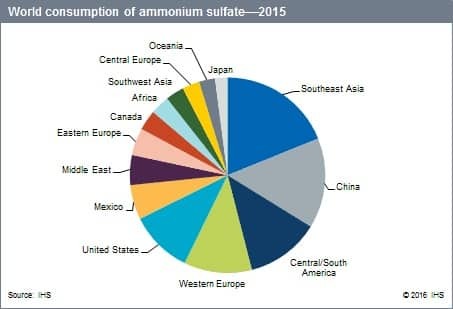 World consumption of ammonium sulfate is concentrated in Southeast Asia, China, Central and South America, Western Europe, and the United States. In general, the industrialized regions account for most of the world's ammonium sulfate capacity, with Western Europe and the United States being overtaken by China in recent years. Because much of ammonium sulfate is produced involuntarily as a by-product or coproduct, the volume of production is influenced more by general industrial output levels than by fertilizer demand. As a result, the major capacity growth during 2000–15 occurred in China, and China is projected to account for the major gain during the forecast period. Capacity grew at a rate of just over 15% annually during 2000–15 in China, but is forecast to slow to 5% annually during 2015–20. Ammonium sulfate has a high sulfur content in the sulfate form, making it readily absorbable by plants. It has a low pH, making it suitable for alkaline soils. As a nitrogenous fertilizer, it competes with urea, ammonium phosphates, and ammonium nitrate. Sulfur has become increasingly recognized as an essential nutrient for plant growth since it supports the synthesis of amino acids, proteins, enzymes, vitamins, and chlorophyll. It has been found to be beneficial to a variety of crops, including canola, alfalfa, corn, potatoes, rice, vegetables, and wheat. There are no serious environmental concerns involved with the use of ammonium sulfate as a fertilizer material. Environmental concern does, however, play an important role in the ammonium sulfate industry in that a significant portion of the world's ammonium sulfate production is the direct result of the necessity to remove SO2 from stack gases at various metal smelting and refining operations in order to conform to government regulations on SO2 emissions. A large potential source of additional by-product ammonium sulfate production is SO2 recovery from coal-fired electrical generating stations. In China, with the extremely rapid development of the caprolactam industry, the volume of by-product ammonium sulfate has increased constantly. Furthermore, encouraged by environmental protection policies, power plant desulfurization has also produced a rapidly increasing volume of ammonium sulfate. The increased amount went primarily to exports. Chinese exports of ammonium sulfate accounted for about 57% of the total production in China, corresponding to an average annual growth rate of about 34% between 2010 and 2015. The majority of ammonium sulfate produced in the United States is generated as a by-product. The US market is mature and is expected to grow at around 3% per year during the next five years. Imports from China have put downward pressure on US ammonium sulfate prices and with ammonia and sulfur prices rising, US producers' product margins have been affected. Producers have reduced their production as a result. Apparent world consumption of ammonium sulfate declined by 0.3% annually during 1987–99, grew at a rate of 2.8% annually during 2000–15, and is forecast to grow at 2.4% annually during 2015–20. During 2000–15, the fastest growing regions were China, Southeast Asia, and Central and South America. In 2013, three regions—Southeast Asia, China, and Central and South America—accounted for about 46% of total world consumption. Although the total nitrogen fertilizer market grew substantially between 1987 and 2015 and significant further growth is forecast by 2020, the bulk of the world demand for nitrogen fertilizer is being filled by urea, another solid fertilizer material with a higher nitrogen content.